Applications, Processes, and Controls is the second volume in the Handbook for Critical Cleaning, Second Edition. Should you clean your product during manufacturing? If so, when and how? Cleaning is essential for proper performance, optimal quality, and increased sales. Inadequate cleaning of product elements can lead to catastrophic failure of the entire system and serious hazards to individuals and the general public. A decade after the bestselling original, the Handbook for Critical Cleaning, Second Edition helps manufacturers meet today’s challenges, providing practical information and perspective about cleaning chemistries, equipment, processes, and applications. With 90% new or revised chapters plus supplementary online material, the handbook has grown into two comprehensive volumes: Cleaning Agents and Systems, and Applications, Processes, and Controls. Overview chapters by the editors, industry icons Barbara and Ed Kanegsberg, meld the different viewpoints and compile and critique the options. The result is a complete, cohesive, balanced perspective that helps manufacturers better select, implement, and maintain a quality, value-added cleaning process. 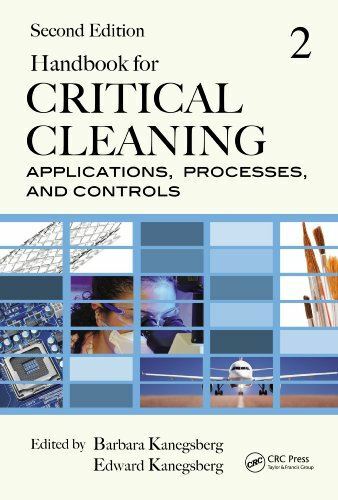 The second volume, Handbook for Critical Cleaning: Applications, Processes, and Controls, addresses how to implement, validate, monitor, and maintain a critical cleaning process. Topics include cleanrooms, materials compatibility, worker safety, sustainability, and environmental constraints. The book shows readers how to draw from diverse disciplines—including aerospace, art conservation, electronics, food, life sciences, military, optics, and semiconductors—to achieve superior productivity.